With DLC becoming so ordinary in today's gaming industry, it is hard to come across DLC that is truly special by setting itself apart from the norm. Sure, we have seen DLC like Red Dead Redemption: Undead Nightmare that has surpassed millions of downloads, but we have seen very little spectacular DLC in the hands of FPS developers. Treyarch has already released one DLC for their blockbuster Call of Duty: Black Ops, and they said that the newly released pack, Escalation, would surpass the first in every way. Does Escalation truly raise the bar, or is it just another ordinary bundle of maps? Read on to find out. First off, if you are looking for a DLC that brings something completely different in terms of gameplay, then Escalation is not for you. 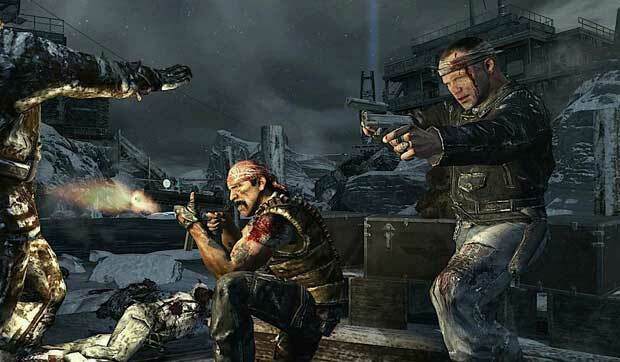 What Escalation does is bring 4 new maps for MP, along with a new zombie map called Call of the Dead. The first map I was thrown into was called Zoo, and I was instantly impressed. The map has a gorgeous look of a rundown zoo, which creates for some fun gameplay. The map, mostly for tight combat, does offer some ranged combat, but you will most likely spend most of your time running through exhibits, checking your corners as you go. Visually, the map looks beautiful, as the littlest details are brought out. All-in-all, Zoo surpassed my expectations, and definitely is one of the best maps available. Next, I was thrown into a map called Convoy, which looks confusing at first, but is one of the best maps for close quarters combat. The map is filled with houses, which means tight corners, and in the middle of a map is a huge wreckage site that is always filled with action. The map, like Zoo, is very pretty, but is set up with so many corners that you can be killed over and over again just by people running by corners. The map is very enjoyable, and will make objective-type COD gamers very thrilled. Stockpile is where I took my next trip, and lets just say that it is the most disappointing map of them all. The map is definitely the sniper map of the four, but nothing about the map separates it from any sniper map that was already on the disc. The map seems like a cross between WMD and Villa, which though visually looks great, offers nothing to put it over the top. Finally, onto one of the best looking Call of Duty maps ever, Hotel. The map is visually gorgeous, and is the best layout of the four. Though the map is called hotel, you can bet for a mix between close quarters combat, and sniping from across the buildings. The map is set up very well, offering places to run-and-gun, and places to hide. Elevators add a unique (and hilarious) addition to the map, as you can always be flanked. Great layout, beautiful scenery, and diverse gameplay create the best map in the DLC. Remember that Zombie map I mentioned earlier? Dubbed the Call of the Dead, this addition to the already beloved zombie mode is excellent and fresh. The map is the biggest of any zombie map so far, and with the addition of the character George, it brings the most insane gameplay. This George fellow spawns near the beginning of the game, and walks around carrying a spotlight with cords hanging out that can kill you. By not shooting him, George stays at a calm state, but when shot at, George goes into his berserk state and chases after you faster than before, keeping you distracted from the other zombies. This addition, seemingly frustrating at first, actually reinvents the mode altogether. Old methods can be thrown out the window, because they will simply fail. The map is laid out very well, but can be very complicated at times. Conclusion: The Escalation map pack is one of the best map packs released by Treyarch thus far. 3 out of the 4 MP maps bring interesting combat, and the zombie map creates hectic, mind-blowing action that can be replayed for a long time. Priced at 1200 MSP, it is something a regular COD fan should check out, and is something a FPS should at least be interested in. With some new, crazy achievements, you will be spending a lot of time with the zombie map - figuring out new methods and strategies. With DLC becoming so ordinary in today's gaming industry, it is hard to come across DLC that is truly special by setting itself apart from the norm. Sure, we have seen DLC like Red Dead Redemption] that has surpassed millions of downloads, but we have seen very little spectacular DLC in the hands of FPS developers. [i]Treyarch has already released one DLC for their blockbuster Call of Duty], and they said that the newly released pack, [i]Escalation, would surpass the first in every way. Does Escalation truly raise the bar, or is it just another ordinary bundle of maps? Read on to find out. Devs should really think about releasing only WORTHY DLC (like BF vietnam, RDR undead nightmare, fallout 3 quests, etc. Stuff that actually matters in one way or another. character skins, map packs (4 for me ain't no pack, are just a couple of pairs...) and such should be in some cases free (1 free map wouldn't ever hurt a dev but help to get things fresh again within the online comunnity wich in any case boosts sales) or really cheap. I have only played 3 of the 4 maps and needless to say, they were pretty good - it's fun screwing people over with the lifts and the doors. And the zombies, takes a little while to adjust to there being someone always there threatening you. I want to play it a little more though before I give my thoughts fully on it. I have only played 3 of the 4 maps and needless to say, they were pretty good - it's fun screwing people over with the lifts and the doors. And the zombies, takes a little while to adjust to there being someone always there threatening you. I want to play it a little more though before I give my thoughts fully on it.